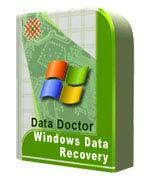 Buy Best Windows data recovery software! To recover your valuable data files and folders lost due to deleted, formatted partitions in all logical crashes from FAT and NTFS file system in the safest mode. Data recovery software for Windows recovers files and folders lost due to damaged or corrupted partitions from FAT and NTFS. The software can retrieve files from FAT, FAT16, FAT32, NTFS file system. Software has attractive graphical user interface provided with built-in help support. Files retrieval Software is capable of recovering data from your logically corrupted hard disk sectors. The advanced algorithms make sure that all directories and sub directories are recovered as they were, and that long file names are rebuilt correctly. Provides best graphical user interface (GUI) for quick data recovery. Recovers data lost due to deleted or formatted partitions in all logical crashes. Recover data from previously existing partitions. The software recovers data from hard disk which have serious impact from bad sectors. The software supports for FAT VFAT FAT12 FAT16 FAT32 NTFS NTFS5 file systems. Software provides support for other storage media including all SATA, IDE, SCSI and EIDE disk devices. Recovers deleted files and folders even after use of shift delete keys or emptied recycle bin.